as well as full set of services through a well-established cloud-based offering. Professionalism and field-proven experience have been the driving force behind corporate success for over 20 years. We apply an agile methodology and effectiveness at all stages of project implementation and organization transformation. Leverage seamless integration with ERP system and IT environment with a one-stop partner to fully fulfill your business needs, and enhance a ready-to-use system. TESISQUARE® SAP Competence Center supports customers to successfully integrate and effectively mantain SAP platform solutions. Customers can experience end-to-end SAP portfolio coverage and effective project implementations. Core competencies include high quality, reliability and value to customer. Application management services give customers high performance, flexibility and predictability, ensuring cost efficiency and continuity in day-to-day operational tasks. Service Management, Support and Maintenance comprise SAP AMS modules including Finance, Logistics and Production Planning. The Competence Center SAP has developed a set of ABAP and SAP-based middleware interfaces between the TESISQUARE® platform and the customer’s SAP system, by greatly reducing deployment time. Enhance agility and benefit from a dedicated provider to centrally run a full set of services effectively and accelerate your go-to-market strategy. Free up your in-house staff to focus on strategic issues and business growth. Help desk outsourcing services enable your organisation to create a more cost-effective and responsive single-point-of-contact for all requests, providing customised services and measurable performances. Take a strategic approach to supplier enablement by accelerating collaboration processes through scalable and modular services, involving both organisational and functional aspects. 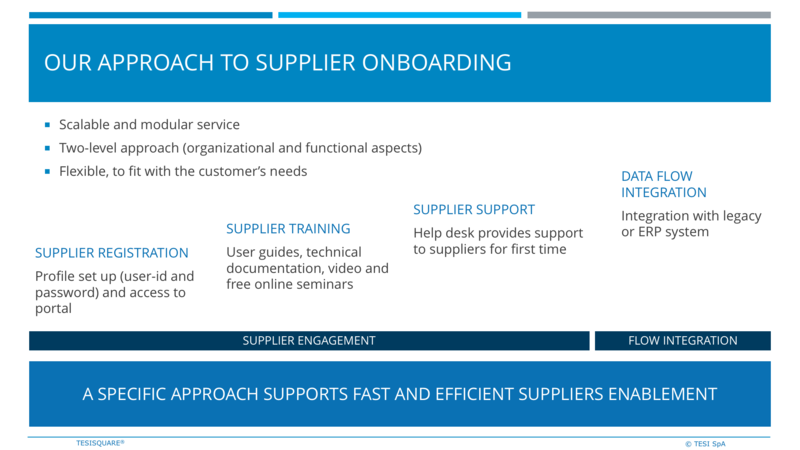 The approach covers all onboarding phases including supplier registration, training, help desk and data flow integration. Our Cloud helps organizations to drive innovation and business transformation by increasing business agility, lowering costs, and reducing IT complexity. We like talking with our customers about the latest novelties, opening our minds to full Innovation, to embrace cutting-edge technologies; we aim to help companies to manage the change that Innovation often entail. Big Data is high-volume, high-speed and high-variety information assets that demand cost-effective, innovative forms of information processing for enhanced insight and decision making. Telemedicine changes the traditional space-and-time sanitary model: space does no more exists and time can be declined with more flexibility, in order to make the access to healthcare more fair, efficient and affordable. Reducing the Time to Value for Internet of Things Deployments. Nobody gives you a better inside of your supply chain than TESISQUARE: just let us integrate devices and solutions for you. Current economic circumstances drive the demand for a more effective model of delivering applications and computing services. Today’s cost- and resources-constrained business world requires executives and IT managers to constantly find new ways to innovate, and the potential that cloud services offer continues to be attractive. The supply chain industry is prime for the cloud because of the sheer number of partners and suppliers that must collaborate to make products. The supply chains of today are highly fragmented with silos of information that make it nearly impossible to share information with trading partners. Businesses need technology platforms that empower them to visualize a product in every stage of its lifecycle, in real time, from raw materials through delivery to end customer. Management must be able to make quick decisions to re-route shipments, locate containers, and collaborate with suppliers to meet customer demand. Businesses need to communicate and share data with their entire trade network. To do this, you need solutions that go beyond the four walls of your business, allow you to track and trace products, shipments and orders, and make it easy to share massive amounts of information across an entire global trade network. TESISQUARE conceives the Big Data as a vision, an aptitude, a definition and realization of a functional and business technologies and competences roadmap aimed at maximizing “exploitation” of data to generate value. Activating Big Data should not necessarily be a “big bang” of a new platform, but it can simply be a “strongly evolving” boost of elements already present in the company. Big Data is not simply the deployment of an analysis platform. At the basis of success is the confidence that you can create with all the stakeholders in relation to the technological tools and expertise. Regardless of where they are on the adoption curve, a clear majority of companies recognize that IoT will have a major strategic or transformational impact on their industries, their customers, and their own operations. For all the opportunity that IoT presents, many companies are nonetheless wary of the challenges and, to some degree, daunted by what they perceive as the cost, time, and resource commitments that a successful IoT deployment may involve. What they ‘re looking for, is an IoT roadmap that accelerates time to value. The IoT value proposition is driven by the ability to translate vast quantities of sensor – based information into action — the faster, the better. IoT solutions, that make it easier to securely connect devices, analyse real-time and historical data, and integrate to back – end applications, represent an attractive option for companies seeking to hit the ground running and accelerate time to value. With real time tracking for all modes of transportation you can monitor the location, security and condition of your asset anywhere on Earth with just one device: just let us integrate it for you.